ATLANTA, Ga. -- Tua Tagovailoa threw a 41-yard touchdown to DeVonta Smith to give No. 4 Alabama a 26-23 overtime victory against No. 3 Georgia to win the College Football Playoff national championship Monday night. 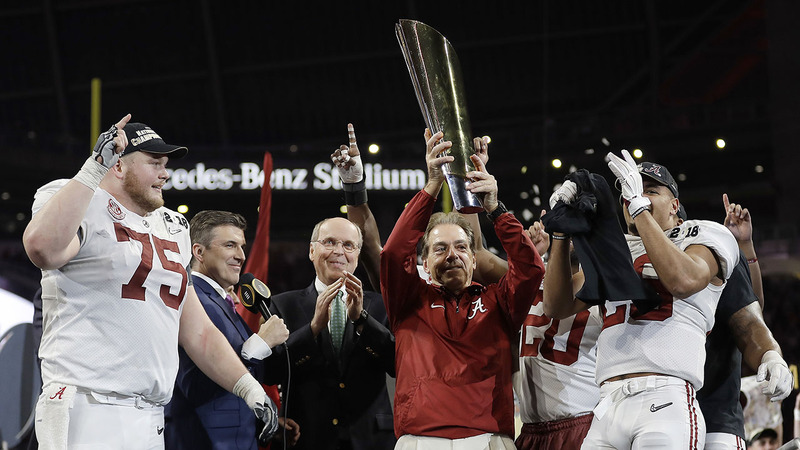 Tagovailoa entered the game at halftime, replacing a struggling Jalen Hurts, and threw three touchdown passes, including the game-ender to give the Crimson Tide its fifth national championship since 2009 under coach Nick Saban. Tagovailoa took a terrible sack on Alabama's first play of overtime, losing 16 yards. On the next play he found Smith, another freshman, streaking down the sideline and hit him in stride for the national championship. Alabama freshman wide receiver DeVonta Smith hauls in the walk-off touchdown pass to end the game and give the Tide another national title. This game will be remembered for Saban's decision to change quarterbacks trailing 13-0. "I just thought we had to throw the ball, and I felt he could do it better, and he did," Saban said. "He did a good job, made some plays in the passing game. Just a great win. I'm so happy for Alabama fans. Great for our players. Unbelievable." "I could not believe it," Saban said. "There's lots of highs and lows. Last year we lost on the last play of the game and this year we won on the last play of the game. These kids really responded the right way. We said last year, 'Don't waste the feeling.' They sure didn't, the way they played tonight." Alabama's Calvin Ridley celebrates his touchdown catch during the second half of the NCAA college football playoff championship game against Georgia on Monday in Atlanta. The Tide trailed 13-0 at halftime and 20-7 in the third quarter after Georgia's freshman quarterback, Jake Fromm, hit Mecole Hardman for an 80-yard touchdown pass that had the Georgia fans feeling good about ending a national title drought that dates back to 1980. A little less than a year after the Atlanta Falcons blew a 25-point lead and lost in overtime to the New England Patriots in the Super Bowl, there was more pain for many of the local fans. With the title game being held 70 miles from Georgia's campus in Athens, Dawg fans packed Mercedes-Benz Stadium, but it turned out to be sweet home for Alabama. Alabama drove into the red zone in the final minute and Saban started playing for a field goal that would end the game and win it for the Tide. A nervous quiet gripped the crowd of 77,430 as 'Bama burned the clock. With the ball centered in the middle of the field, Pappanastos lined up for a kick to win the national championship. The snap and hold looked fine, but the kicked missed badly to the left. For the second straight week, Georgia was going to overtime. The Bulldogs beat Oklahoma in a wild Rose Bowl in double overtime to get here, and after Jonathan Ledbetter and Davin Bellamy sacked Tagovailoa for a big loss on the first play, Alabama was in trouble - second-and-26.